Reply 'For Mr Cumberland Reid'.. Probably drawn-up for the patient himself. Cullen gives detailed advice on a regimen to manage his gout (sections are not numbered but nonetheless entered on database as a formal regimen). 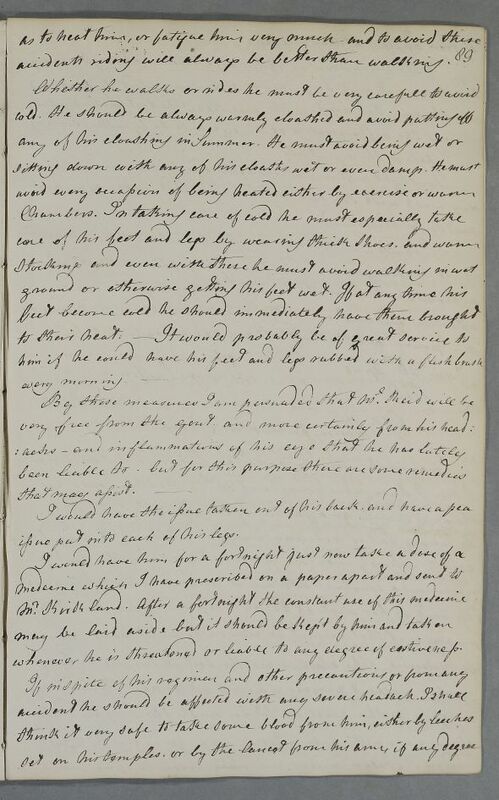 Cullen also discussed what treatments to follow for an inflammation of the eye, including use of leeches and eye-bath. The 'paper apart' with recipe, mentioned as having been sent to Mr Kirkland directly is Document ID:3625. Summary Reply 'For Mr Cumberland Reid'.. Probably drawn-up for the patient himself. Cullen gives detailed advice on a regimen to manage his gout (sections are not numbered but nonetheless entered on database as a formal regimen). 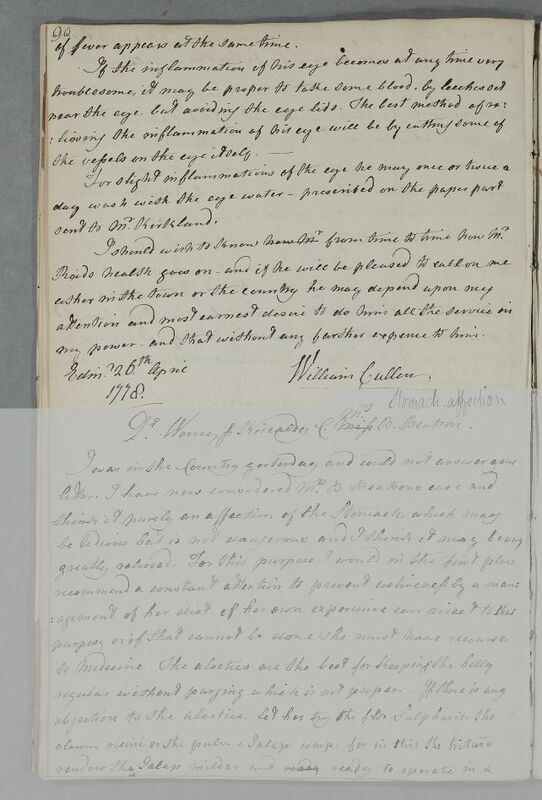 Cullen also discussed what treatments to follow for an inflammation of the eye, including use of leeches and eye-bath. The 'paper apart' with recipe, mentioned as having been sent to Mr Kirkland directly is Document ID:3625. Case of Mr Cumberland Reid whose symptoms are attributed to a gouty disposition. be prescribed and I propose the following. food and live upon milk, grain and other vegetables. on roots or greens but rather prefer the milk and grain. He should avoid eggs, and take very little cheese. or Spiritous or Spirituous liquors and take to water alone. accidents riding will always be better than walking. issue put into each of his legs. whenever he is threatened or liable to any degree of costiveness. of fever appears at the same time. I should wish to know how Mr from time to time how Mr.
my power – and that without any farther expence to him. 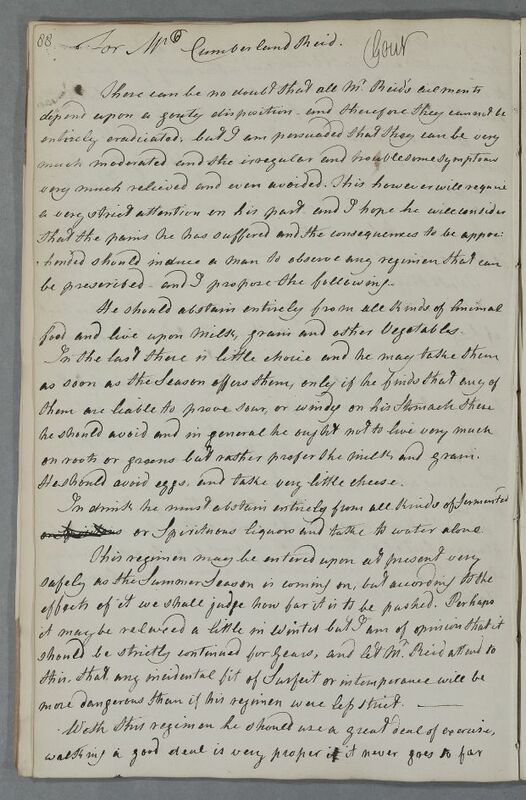 1: Recipe is probably Document ID:3625, which is linked to this case.